Jim Mason was getting used to the same old routine experienced by many heart failure patients: Feel good for a while, have shortness of breath, swelling in his legs and abdomen and then back to the hospital. It’s a cycle that makes managing the disease particularly difficult. Now thanks to a procedure being performed at Backus Hospital by Hartford HealthCare Heart & Vascular Institute physicians, Mason’s providers can remotely monitor his condition and make changes before symptoms require hospitalization. During the outpatient procedure, using technology known as CardioMEMS, a battery-free sensor is implanted into the patient’s pulmonary artery to help monitor the pressure from the artery. Once implanted, heart failure patients spend a few minutes each day at home lying on a special pillow that acts as an antenna to read the implanted sensor. The pillow then transmits the pressure readings through a secure website, where it is reviewed by the patient’s cardiology team. Mason, from Charlestown, R.I., underwent the procedure at Backus Hospital on Jan. 30 — the first in the Hartford HealthCare system. The CardioMEMS system has since been introduced to patients at Hartford Hospital and soon The Hospital of Central Connecticut. “I was starting to feel winded after walking a real short distance on Friday. Later that day, [after lying on the transmitting device], the office called and said I needed to increase my medication,” said Mason who had been admitted to the hospital three times in December before having the device installed. Mason’s cardiologist, Howard L. Haronian, MD, East Region Vice President & Chief Medical Director of the Hartford HealthCare Heart & Vascular Institute, said a randomized trial comparing HF patients with and without the device, using the same medication and treatment algorithms shows a nearly 40 percent reduction in hospitalization and an increased quality of life. 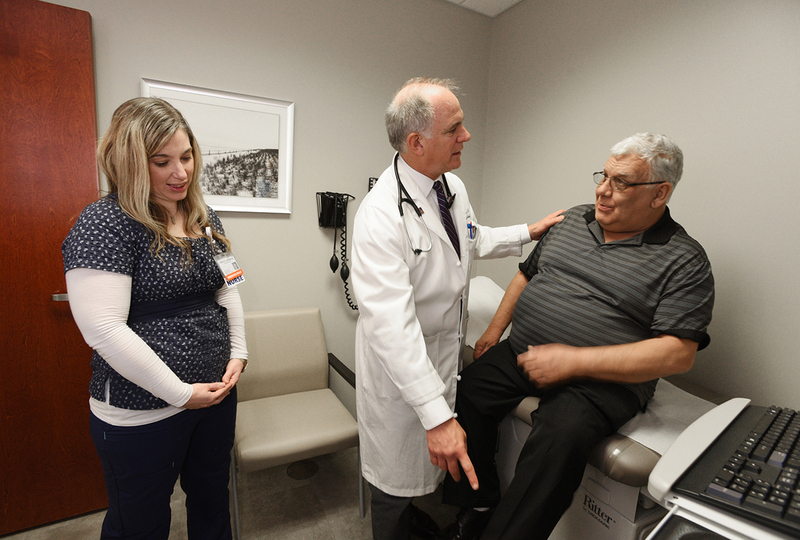 Dr. Haronian said he’s pleased that the procedure can now be offered in community hospitals like Backus where patients don’t always have immediate access to advanced care for heart failure. Mason agrees. “If I didn’t have this, I’m sure I’d already be back in the hospital,” he said. Learn more about CardioMEMS here.